I grew up in a garden culture. My parents always had a garden, as well as both sets of grandparents. I have a great-uncle who is legendary for his gardens. Even today at his assisted-living complex, he keeps one at 90 years of age. 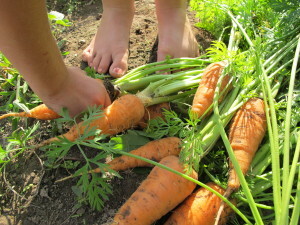 When my parents got into the homeschool movement, we found that most families considered it virtuous to have a garden. A big one. Then we met the Mennonites. Oh my. Not only did they spend many hours in their huge gardens, but also in the kitchen, prepping their harvests and canning, canning, canning. It seemed that they didn’t even give a thought to the lazier, more expensive method of freezing that we used at home. So when I reached adulthood, it seemed a given that a good woman had her garden! I spent many hours trying to carve out productive garden spaces at our earlier homes, none of which had an established plot. When we moved to our current farmhouse, I was elated to discover it had an enormous existing garden. I pictured our family spending happy hours together there during those long, luminous summer evenings. In reality though, babies number three and four arrived during the next few years and life took a turn toward the chaotic. My ambitiously-planted gardens were weed-choked by mid-July. I felt guilt and a sense of failure as I looked out of the window at my plot and remembered those Homeschool and Mennonite gardens. To make matters worse, as much as I loved puttering in the dirt on cool summer eves, I despised working in the kitchen. Canning and freezing rarely got done. I was doing well if I could get supper on the table! I don’t know why it took so long for the light of Simplification to shine upon the garden in my life. So now I have a salad garden. Everything we grow in there is just for fresh eating, so I can work in the garden and not the kitchen! There are flowers for cutting. It is small and achievable for a mom of young children. It is a blessing instead of a burden. It is gardening MY style. 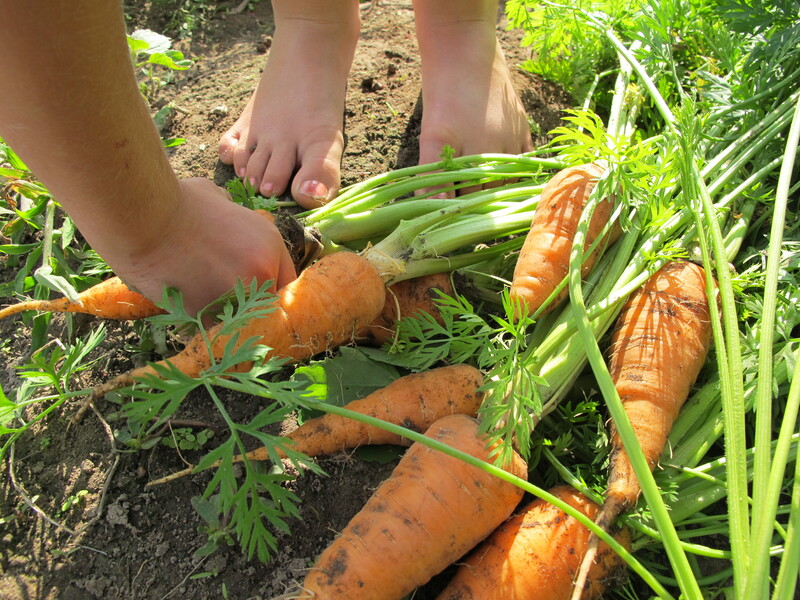 Caracas carrots – Cute baby carrots that stayed nicely-shaped and were easy to pull and fun to eat. Orange Cutie pumpkins – Pretty little 3lb pumpkins with cream streaks. The plants are semi-bush and I was able to fit two of them in the garden, which produced 50 pumpkins! I will use some for autumn decor but they are supposed to make good eating as well. This is how I envision our garden. I don’t plan on canning or freezing, we want just enough to eat fresh and pass some on to neighbors and friends. Learning to keep things simple so you can enjoy life rather than spending all your time rushing from one thing to another in order to feel more “proverbs 31”. Yes! I love that, Joy.